Thanks to Kate who sent me the news that Cheap Chic Weddings had declared the winner of their Toilet Paper Wedding Dress contest. This dress, created by Hanah Kim, won second place, but it's more interesting than the first place winner, in my opinion. Look at the detail! The rows and rows of ruffling! If you click on the image you can see the back of the dress, which is just as stunning. I completely, totally agree with you Hanah Kim should have won first place, and by a long margin. While some of the other dresses also had wonderful style, in hers the amount of work and detail alone was incomparable, I feel. And the level of polish, and patience, that had to go into keeping the papery details of that dress under such precise and elegant control.What a pleasure veiwing all of those dresses, though! In a sense, everyone should have won a prize! Sometimes competition really bugs me. I know very well the arguments people use FOR competition as a value, but particularly when it comes to contests, for example, it can seem to me to be so arbitrary and to create a false image of a person’s abilities in making them seem larger than life while relegating others to the status of somehow inferior. And it ain’t always true. I actually believe yes that brilliance and talent are a human birthright, and not that greatness is a rare and God-given thing. And sometimes competition actually works against encouraging us to develop. Especially when things are more or less equal between people being judged against each other.After all that, though, I’m not arguing that the entries in this contest were all on equal footing. Hanah Kim deserves a special kind of mention for her jaw-dropping creation. A little thundershower and the whole mess would be in the sh*tter!! Sorry that some of the writing above isn’t as clear as it might have been. I received a phone call right in the middle of composing it! Those dresses are incredible but…why? I can see if the prize was some serious money, but damn, I don’t think the possibility of winning a $500 gift card (to where? not specified; not cash at any rate) is worth my time! And $50? Pfft. It’s obvious that all the entrants are crafty ladies who probably sew. I certainly wouldn’t devote my precious sewing time to this! I’m glad somebody did though because they’re fun to look at. Not only should Hanna Kim have won – her creation was beautiful – but the other runner-up dresses were far superior to the winner! I am really shocked. So many of the other dresses actually LOOKED LIKE DRESSES and the winner’s dress appears poorly put together and is far too simple. I think it’s fascinating that anyone managed to carry this off, however.Thanks for the interesting link! Heirloom styling in toilet paper…I’m hyperventilating just at the thought of how many hours it took! Hanah Kim wins the stying and patience awards. What a fabulous dress. That dress is fabulous and way better than the first place. It is really beautiful. that is amazing! apparently they sell the t.p in a monogramed version too? i don’t think i want people to be wiping their bum with my initials! Don’t they play “toilet paper bride” at wedding showers everywhere? Now, Hanah Kim’s dress was far more spectacular than anything I’ve ever seen and obviously a special production, but the rest of the T.P. brides looked like things I’ve seen created at wedding showers. Hanah totally should have won first prize. That dress was amazing. You’re right about that second dress; from all standpoints, it’s far, far more interesting than the first, which reminds me of something Cinderella might wear. Not that there’s anything wrong with that. I was perusing the description of last year’s winning dress, when I caught this: “working toilet paper buttons.” I did a double, or even a triple take. Did that say, “working toilet paper buttons!? !” You can’t see them in the pictures, but holy cow. I can’t even begin to think how you’d accomplish that – let alone the button holes. Dang! I’ve spent many an hour at bridal showers trying to make dresses out of toilet paper, garbage bags, you name it; and despite all my hard work and inherent talent [ahem. ], NOTHING I’ve made even compares to this. That itty-bitty pleating is giving me a headache just thinking about it. How did [whoever] make those buttons? Maybe if you soaked the T.P. in glue, and then did a papier-mache sort of thingy. However, I must admit: I did create a rather stunning toilet-paper dress for “Potiphar’s Wife Barbie” (formerly known as Jasmine from “Aladdin”) as a visual aid for my 10 yr-old Sunday School class that was much praised. Half goddess, half Cleopatra.I think I need a hobby. I want to see Hannah Kim on the next Project Runway! If she can do THAT with toilet paper, just imagine her creations. Oh, wow. I actually love that dress! And yes, she was robbed of 1st prize. i am the local seamstress….and i guarantee you that will happen. in satin though, not silk. blech. 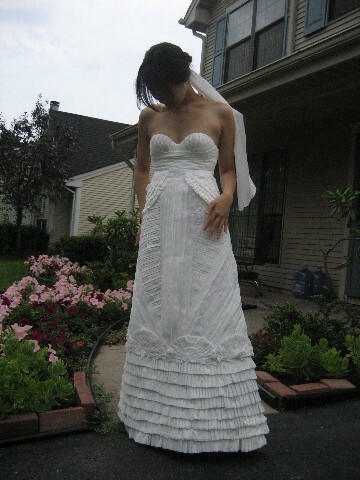 I agree that the intricate pleating is interesting, but it also makes the dress look weirdly stiff. I like the first place dress better, and I suspect it was difficult to construct, too. It must have been hard to get a tp skirt to look so full, and to look like it hangs the way a dress ought to.